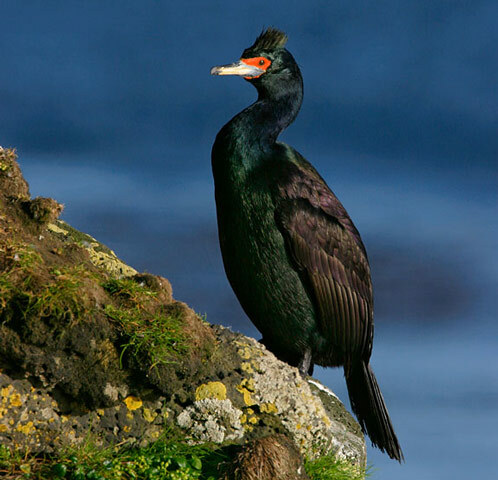 Red-faced Cormorant: Range in North America restricted to coastal Alaska. Prefers rocky coasts for both feeding and breeding habitat. The Red-faced Cormorant is also known as the Red-faced Shag or Violet Shag. 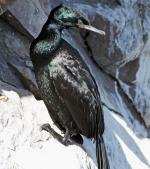 It is the least gregarious of all cormorants, nesting on steep, inaccessible cliff faces, and is shy of human approach. Possibly owing to its shy habits and hard to reach colony sites, it is one of the least studied and least known birds of the North Pacific. The Red-faced Cormorant has a large range, estimated globally at 100,000 to 1,000,000 square kilometers. Native to China, Japan, Taiwan, the Russian Federation, the United States and Canada, this bird prefers neritic, intertidal, or coastal marine ecosystems. The global population of this bird is estimated at 200,000 individuals and does not show signs of decline that would necessitate inclusion on the IUCN Red List. 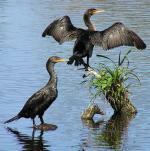 For this reason, the current evaluation status of the Red-faced Cormorant is Least Concern.